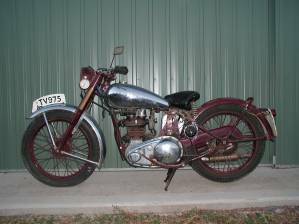 Jim purchased this complete - but non-running - 1949 BSA C11. 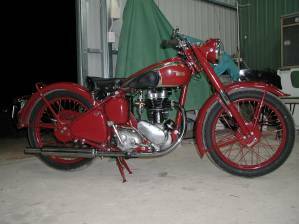 Having just finished a 1954 Bantam he decided to have a go at a four stroke. Over the next two years the bike was completely stripped, paintwork rubbed down, wheels rebuilt and new bearings fitted. The frame and tinware was etch primed and painted entirely using aerosol automotive paints. This was a process of trial and error which in the end has produced a remarkable finish which is often mistaken for two-pack. The engine was partially stripped and the bottom end proved to be sound. As was discovered, the top end was to be the problem area for this bike! The clutch was rebuilt and the plates re-corked. All new chains and gaskets were fitted. Jim and I rewired the bike and all the components (regulator and dynamo) and working fine. 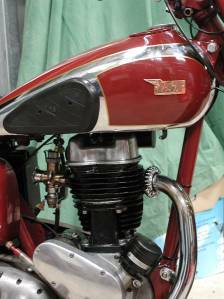 In early 2005 the first runs on the bike revealed it to be underpowered and burning a little oil. It was decided to fix the problem. A fateful decision! After deciding to fix the problem it was a "simple" matter to go for a rebore, new piston and rings. Result: less power and more smoke. Considerably more smoke. Off to an engineer for new valve guides. Still smoking. Another engineer who pronounced the first valve guides to be faulty. This time, new valve guides, new valves and springs. Still smoking. The engineer made the exhaust guide again because the smoke was so serious that oil was dripping out of the exhaust. The smoke was very, very thick and it was quite impossible to consider riding the bike on the road. We were at a loss to understand what was causing this. Finally, at the insistence of one of the shed crew (Lawrie) we decided to strip it down one last time. Out came the spark plug - oil dripping off it. Up came the barrel and pictured left is one piston swimming in oil! This was no valve guide problem. We removed the rings and found the the top two rings are each marked "TOP" and had been fitted upside down. 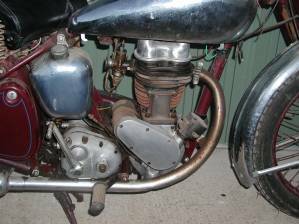 The bike has tapered rings and the original mechanic who did the rebore and new piston/ring set had missed this. 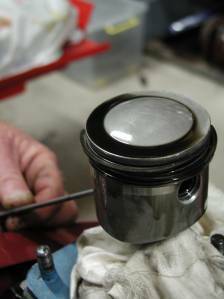 With the tapered rings upside down the piston acts like a pump drawing oil up into the combustion chamber. We refitted the rings with "TOP" facing up and she runs sweetly! One last lesson - with a bit of jiggling you can remove the barrel from a c11 and leave the head in place. Great restoration - a full set of pics will follow as soon as we get a sunny day.